Dun Agro, a Dutch company recently unveiled a home that is made entirely from hemp, a variety of the cannabis plant. 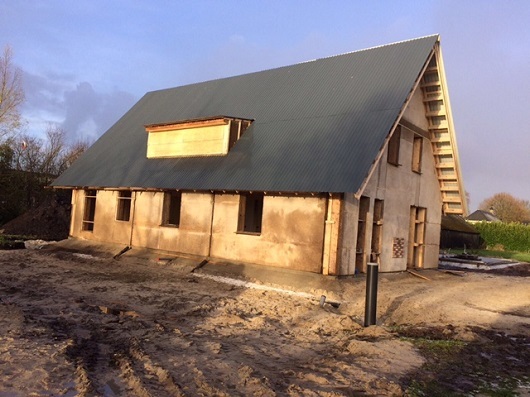 The Dutch company specializes in 'hemp concrete’ or hempcrete as it is also called. The material is made from the fibers of hemp mixed with water and glue or lime. This is then passed through a mold to make prefabricated sections for houses. A three-month waiting period ensures that the mixture is properly dried and hardened before the home can be assembled. These sustainable homes offer hope for the future especially for those looking for affordable housing. These durable, prefabricated homes, which are resistant to earthquakes, can be set up in a very short span of time at an affordable cost. The company has opted for hemp as the main construction material as the environmental benefits of using hemp cannot be discounted. Hemp is able to bring about a big reduction in atmospheric carbon dioxide as it can take in about 22 tonnes per hectare during its growth. What is even more interesting about using hemp is that it continues to absorb carbon as the lime used in hempcrete begins to calcify over time making the walls even stronger. The use of hemp in building materials is not new. In fact, it has been used for centuries in the Middle East and Asia where the Cannabis plant originated. Dun Agro, however, claims that it is the first company to have succeeded in building a prefabricated hemp home. The first hemp home was displayed last November. The company which has already completed its second home has plans to construct more homes from hemp in the future. It hopes that the demand for these homes will go up. Hemp is being grown on a large scale in the Netherlands for environmental and agricultural reasons. 1,100 hectares of agricultural land is presently being used for growing hemp. Farmers find hemp economically viable as it grows quickly, it doesn’t require pesticides and the roots of the plant are also known to enrich the soil. It works well as an intermediate crop which means that it is a source of additional income for farmers. Given the abundance of hemp in the Netherlands, Dun Agro says that it can build as many as 500 hemp houses a year. If the demand for the houses goes up, the company is quite sure it can easily meet growing demands.